As Israel’s most recent massacre in Gaza continues, and as police in the U.S. continue to violently repress protesters who are exercising their fundamental human right to challenge injustice and demand an end to racist police killings, activists in each conflict have tied their struggles together. Protesters in Ferguson have noted parallels between the state-sanctioned violence in Israel and the state-sanctioned racist violence at home (and the shared military training between both forces). Palestinians have shared tips for dealing with tear gas attacks. Jewish organizations have too noticed “the similarity in the tactics and technologies of repression against those who are rising up nonviolently in both places” and have stood in solidarity with the protesters. On 19 August, the Popular Front for the Liberation of Palestine (PFLP), a secular revolutionary leftist organization that has historically stood at the forefront of the Palestinian liberation movement, released its own official statement of solidarity with Ferguson, “salut[ing] and stand[ing] firmly with the ongoing struggle of Black people and all oppressed communities in the United States.” The statement is based largely on an interview with Palestinian writer and activist Khaled Barakat. The PFLP echoes the writer’s statements, adopting them as its official position. via As'ad Abukhalil on Leila Khaled and Syria. 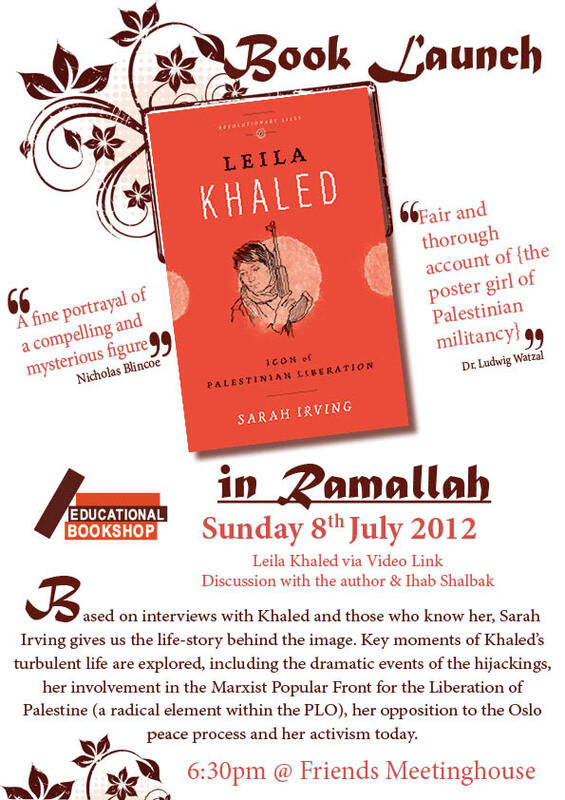 Details are here for launch events for the Leila Khaled biography in Jerusalem, Ramallah and Bethlehem on the 7th, 8th and 9th of July respectively. All organised by that Palestinian Jerusalem institution, the Educational Bookshop. The Daily Star, 14th June 2012. Ultimately, the biographer’s major accomplishment is to remake a decades-old revolutionary icon into a living, breathing woman. Yes, Khaled is an activist and a political voice on contemporary Palestinian affairs and her commitment to her cause has endured. Her wit and bloody-mindedness in the face of occupation have not lessened an iota. In Irving’s portrayal, Khaled is a wife and mother faced with the challenges of raising a family, but one with the additional concerns of a Palestinian refugee and former militant. That Irving has found space in this light volume for extensive exploration of the evolution of women’s rights within the Palestinian resistance is testament to the author’s economy with words. 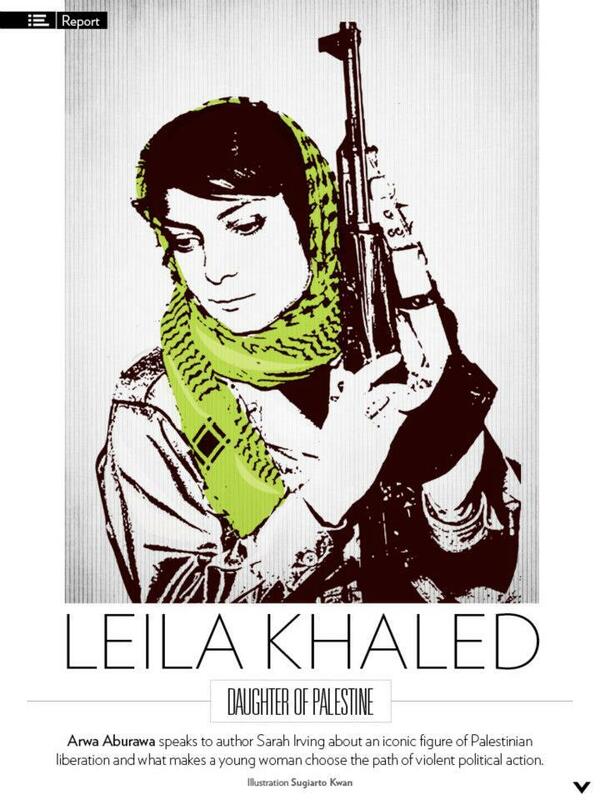 “Leila Khaled – Icon of Palestinian Liberation” is an ideal read for those seeking a brief introductory account that neither glorifies or vilifies its subject nor dumbs down the complexity of the context in which she lived and worked.